Brown Damascus Skikoto Tanto | BUDK.com - Knives & Swords At The Lowest Prices! Blade etchings translate to: "United Strong Steel"
This Shikoto Tanto from United Cutlery features a powerful Damascus blade with a strikingly beautiful pattern. From the powerful, full-tang blade to the leather and genuine ray skin wrappings on the handle, quality is evident in the exquisite details. The sheath was leather and thus a tight fit for the blade, after a couple of times of pushing the blade in it started to rip of the sheath, also being so tight the sheath was rubbing the blade which apparently is dyed a darker color thus the dye rubs off because of the sheath. Received mine with a scratch on the pommel and 2 small dents in the blade. I will say that if you wanted to display this tanto without using the sheath it is beautiful and the leather rapped ito is very nice. 5 stars for looks, 2 stars for practicality. United Cutlery creates some of the finest Damascus swords you can by in this price range, one of the things about there swords is the tangs are Damascus as well, witch is very unusual. 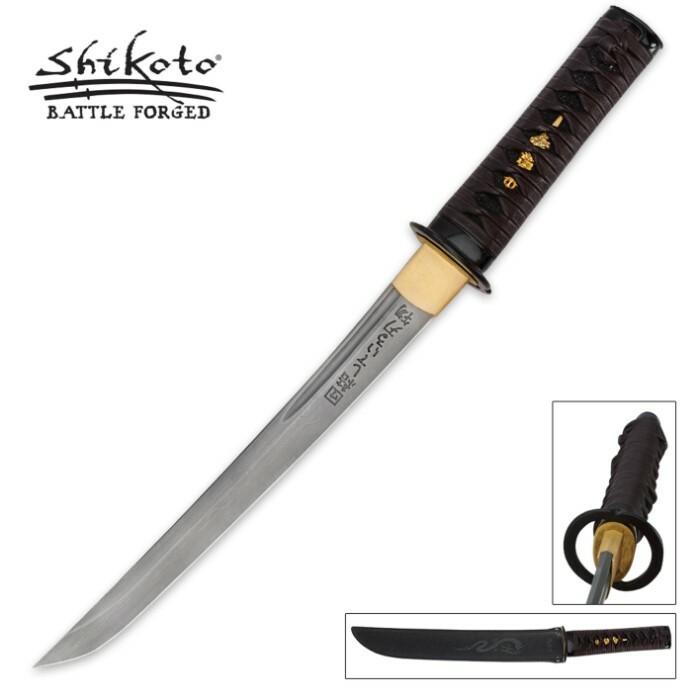 As an expert in bladed weapons I highly recommend the Skikoto Tanto's, the only thing is the Kanji symbols actually say "United steel is strong". Thank you Daniel of Nebraska.